Though 3 Days to Kill will never win an Oscar or a Golden Globe, it is a fast paced film, the is enjoyable when you just want to relax and have some good old action fun on your TV. Luc Besson's latest writing effort, 3 Days To Kill blends high action with sentimental drama. Kevin Costner (Man of Steel, Draft Day) plays international spy Ethan Renner, who is literally running out of time. As a highly skilled assassin with a reputation for excellence with dangerous missions, Renner is highly sought after. But when his health declines, he figures it's time to quit and work on what is really important: repairing his relationship with his now teenage daughter Zooey (Hailee Steinfeld, True Grit). Renner's plan goes well until CIA agent Vivi (Amber Heard, Zombieland, Pineapple Express) shows up and offers him an experimental drug that could save his life. Of course, the offer comes with a catch. Renner has 3 days to kill "the Wolf" (Richard Sammel), a ruthless, international terrorist. Renner now has to juggle one final assignment with a reluctant and rebellious Zooey, who resents the sudden return of her absentee father. To complicate things, the lifesaving drug means Renner has to drink an entire bottle of vodka just to combat the side effects. Set in beautiful, scenic Paris, 3 Days gets your blood pumping with action filled chase scenes, as Renner pursues the bad guys and makes you give into your more sentimental side as you watch Renner, say, train Zooey how to ride a bicycle. The contrast between tough guy, spy, and doting father gives 3 Days a unique look into how complicated real life can be — as many of us can relate to the struggle of being an active parent while managing the demands of work. Costner's acting is superb as usual, even in this limited role. Costner and Steinfeld truly make us believe they are real father and daughter. On the other hand, Heard, and Connie Nielsen (Devil's Advocate, The Following) as Ethan's ex-wife, seem to be merely reciting their lines, not infusing their performances with their acting skills. 3 Days to Kill is encoded with the latest AVC codec using a 2.373:1 aspect. The beauty of Paris really shines through in the color palette in the film, and the masters have done the Blu-ray justice with a pristine, sharp, crisp color print. Aiding the image is a lossless DTS-HD Master Audio 5.1 that helps fully immerse you in the film. The only area lacking on the Blu-ray is the Special Features. It contains the requisite fluff piece on the making of the film; "A Profile of McG" (which only shows further why he isn't a great filmmaker); "Covert Operations", a five minute look inside the life of a former CIA agent; and the theatrical trailer. Download 3 Days to Kill from the iTunes Store in Digial HD. 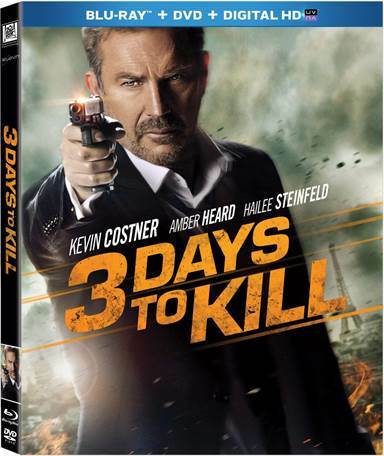 For more information about 3 Days to Kill visit the FlickDirect Movie Database.